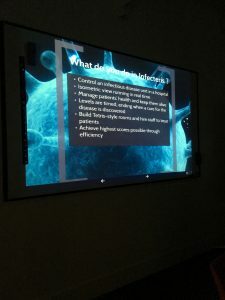 There was something very different happening at the Infection Group at St Andrews as we welcomed 3rd Year students from Abertay University who came to describe their new game Infecteris. The group are named Idle Champions, although they are clearly not idle at all as they have made enormous progress in developing their game from concept to prototype in only a few months. 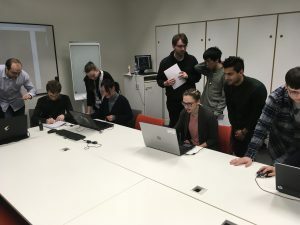 This new game which, is being produced as part of their third year of studies, is being developed as a platform for infectious diseases education. Players have to diagnose and treat new patients coming into hospital, whilst simultaneously building the hospital, managing resources and making sure the infections do not spread further. At each of the stages the player can be asked questions that can test infectious diseases learning. The music and graphics contribute to provide an exciting atmosphere. Scott McGaig, the producer and this team which includes sound experts, artists and programmers have combined to produce a fast-paced game. Although only in evolution and this was a chance for the infection group to play and call it work whilst giving feedback to the talented gaming team.